What is evil to a man's mind is good for his god. Who can comprehend the counsel of the gods in heaven? The plan of a god is deep waters, who can fathom of it? Where has befuddled mankind ever learned what is a god's conduct? Between 9000 B.C. and the beginning of the Christian era, western civilization came into being in Egypt and in what historians call Ancient Western Asia (modern-day Cyprus, Syria, Lebanon, Israel, Jordan, Turkey, southwestern Russia, Iraq and Iran). The earliest permanent settlements occurred between 9000-6000 B.C. and were accompanied by the domestication of plants and animals. Between 4000-3000 B.C., the first cities appeared in response to the pressures of population growth, the organizational requirements of irrigation and the demands of more complex trade patterns. According to our previous definitions, these societies of Egypt and Ancient Western Asia correspond to what we would call civilization (see Lecture 1). Around 10,000 B.C., many hunter-gatherers living along the coastal plains of modern Syria and Israel and in the valleys and hills near the Zagros Mountains between Iran and Iraq began to develop special strategies that led to a transformation in the human community. Rather than constantly traveling in search of food, people stayed in one region and exploited the seasonal sources of food, including fish, grain, fruits and game. At a community such as Jericho, people built and rebuilt their mud brick and stone huts rather than moving on as had their ancestors. In general, these communities began to focus on seasonal food sources and so were less likely to leave in search of new sources. The ability to domesticate goats, pigs, sheep and cattle and to cultivate grains and vegetables changed human communities from passive harvesters of nature to active partners with it. The ability to expand the food supply in one area allowed the development of permanent settlements of greater size and complexity. The people of the Neolithic or New Stone Age (8000-5000 B.C.) organized fairly large villages. Jericho grew into a fortified town complete with ditches, stone walls, and towers and contained perhaps 2000 residents. Catal Hüyük in southern Turkey may have been substantially larger. Although agriculture resulted in a stable food supply for permanent communities, the revolutionary aspect of this development was that the community could bring what they needed (natural resources plus their tool kit) to make a new site inhabitable. This development made it possible to create larger communities and also helped to spread the practice of agriculture to a wider area. Farmers in Catal Hüyük cultivated plants that came from hundreds of miles away. The presence of tools and statues made of stone not available locally indicates that there was also some trading with distant regions. Agricultural society brought changes in the organization of religious practices as well. Sanctuary rooms decorated with frescoes and sculptures of the heads of bulls and bears shows us that structured religious rites were important to the inhabitants of these early communities. At Jericho, human skulls were covered with clay in an attempt to make them look as they had in life suggesting that they practiced a form of ancestor worship. Bonds of kinship that had united hunters and gatherers were being supplemented by religious organization, which helped to regulate the social behavior of the community. The history and culture of Mesopotamian civilization is inextricably connected to the ebb and flow of the Tigris and Euphrates Rivers (see map). The earliest communities developed to the north but since rainfall in that area was so unpredictable, by 5000 B.C. communities had spread south to the rich alluvial plain. The economy of these communities was primarily agricultural and approximately 100-200 people lived in these permanently established villages. The alluvial plain in southern Mesopotamia ("land between the rivers") was far more fertile than the north but because there was little rainfall, irrigation ditches had to be constructed. Furthermore, the river beds of the Tigris and Euphrates rise and fall with the seasons and they change their course unpredictably. Southern Mesopotamia also had its share of flash floods which could destroy crops, livestock and village homes. Floods and torrential rains were a significant theme in Mesopotamian literature as depicted in the EPIC OF GILGAMESH. With it in hurling speed. Because the land closest to the river was the most fertile, there was a variation in terms of the wealth of these early farmers, which led to distinct social classes. At the same time, the construction of canals, ditches and dikes essential to irrigation demanded cooperation between different social groups. Decision-making, regulation and control of all food production and herding meant cooperation. And because more food could be produced by less people, some people gave up farming and became craftsmen, laborers, merchants and officials and this too required cooperation. The Mesopotamians built massive temples or ziggurats which housed the priestly class, the human representatives of the gods. The priests controlled the religious life of the community, the economy, land ownership, the employment of workers as well as the management of long distance trade. 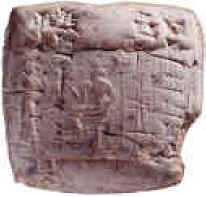 The city-state was Sumer's most important political entity. The city-states were a loose collection of territorially small cities which lacked unity with one another. Each city-state consisted of an urban center and its surrounding farmland. The city-states were isolated from one another geographically and so the independence of each city-state became a cultural norm with important consequences. For instance, it was held that each city-state was the estate of a particular god: Nannar (moon) was said to have watched over the city-state of Ur; Uruk had An (sky), Sippar had Utu (sun) and Enki (earth) could be found at Eridu. Nippur, the earliest center of Sumerian religion, was dedicated to Enlil, god of wind (Enlil was supplanted by Marduk at Babylon). Each city-state was sacred since it was carefully guarded by and linked to a specific god or goddess. Located near the center of each city-state was a temple. Occupying several acres, this sacred area consisted of a ziggurat with a temple at the top dedicated to the god or goddess who "owned" the city. The temple complex was the true center of the community. The main god or goddess dwelt there symbolically in the form of a statue, and the ceremony of dedication included a ritual that linked the statue to the god or goddess and thus harnessed the power of the deity for the benefit of the city-state. Considerable wealth was poured into the construction of temples as well as other buildings used for the residences of priests and priestesses who attended to the needs of the gods. The priests also controlled all economic activities since the economy was "redistributive." Farmers would bring their produce to the the priests at the ziggurat. The priests would "feed" and "clothe" the gods and then redistribute the remainder to the people of the community. What you have ordered comes true! The utterance of Prince and Lord is but what you have ordered, do agree with. The relationship of human beings to the gods was based on subservience since, according to Sumerian myth, human beings were created to do the manual labor the gods were unwilling to do for themselves. As a consequence, humans were insecure since they could never be sure of the god's actions. But humans did make attempts to circumvent or relieve their anxiety by discovering the intentions of the gods; these efforts gave rise to the development of the arts of divination, which took a variety of forms. A common form, at least for kings and priests who could afford it, involved killing animals, such as sheep or goats, and examining their livers or other organs. Supposedly, features seen in the organs of the sacrificed animals foretold of events to come. Private individuals relied on cheaper divinatory techniques. These included interpreting patterns of smoke from burning incense or the pattern formed when oil was poured into water. The CODE OF HAMMURABI reveals a society of strict justice. Penalties for criminal offenses were severe and varied according to the wealth of the individual. According to the code, there were three social classes in Babylonia: an upper class of nobles (government officials, priests, and warriors), the class of freemen (merchants, artisans, professionals, and wealthy farmers), and a lower class of slaves. An offense against a member of the upper class was punished with more severity than the same offense against a member of a lower class. The principle of retaliation ("an eye for an eye, a tooth for a tooth") was fundamental. It was applied in cases where members of the upper class committed criminal offenses against their own social equals. But for offenses against members of the lower classes, a money payment was made instead. Slaves were used in temples, in public buildings, and in the homes of private individuals. Most temple slaves were women who did domestic chores. Royal slaves were used to construct buildings and fortifications. Slaves owned by private citizens performed domestic chores. The laws were harsh for those slaves who tried to escape or who were disobedient. Slaves did possess a number of privileges: they could hold property, participate in business, marry free man or women, and eventually purchased their own freedom. The number of laws in Hammurabi's code dedicated to land and commerce reveal the importance of agriculture and trade in Mesopotamian society. Numerous laws dealt with questions of landholding, such as the establishment of conditions for renting farmland. Tenant farming was the basis of Mesopotamian agriculture. Ten farmers paid their annual rent in crops rather than money. Laws concerning land-use and irrigation were especially strict. If a landowner or tenant failed to keep dikes in good repair he was required to pay for the grain that was destroyed. If he could not pay he was sold into slavery and his goods sold, the proceeds of which were divided among the injured parties. Rates of interest on loans were watched carefully. If the lender raised his rate of interest after a loan was made, he lost the entire amount of the loan. The Code of Hammurabi also specified the precise wages of laborers and artisans. Mesopotamian society was a patriarchal society, and so women possessed far fewer privileges and rights in their marriage. A woman's place was at home and failure to fulfill her duties was grounds for divorce. If she was not able to bear children, her husband could divorce her but he had to repay the dowry. If his wife tried to leave the home in order to engage in business, her husband could divorce her and did not have to repay the dowry. Furthermore, if his wife was a "gadabout, . . . neglecting her house [and] humiliating her husband," she could be drowned. Fathers ruled their children as well as their wives. Obedience was expected: "If a son has struck his father, they shall cut off his hand." If a son committed a serious enough offense, his father could disinherit him. It should be clear that the Code of Hammurabi covered virtually every aspect of an individual's life. Although scholars have questioned the extent to which these laws were actually employed in Babylonian society, the Code of Hammurabi provides us an important glimpse into the values of Mesopotamian civilization.